We’re pleased to share a special limited edition sculpture by Sascha Braunig to benefit the New Museum. 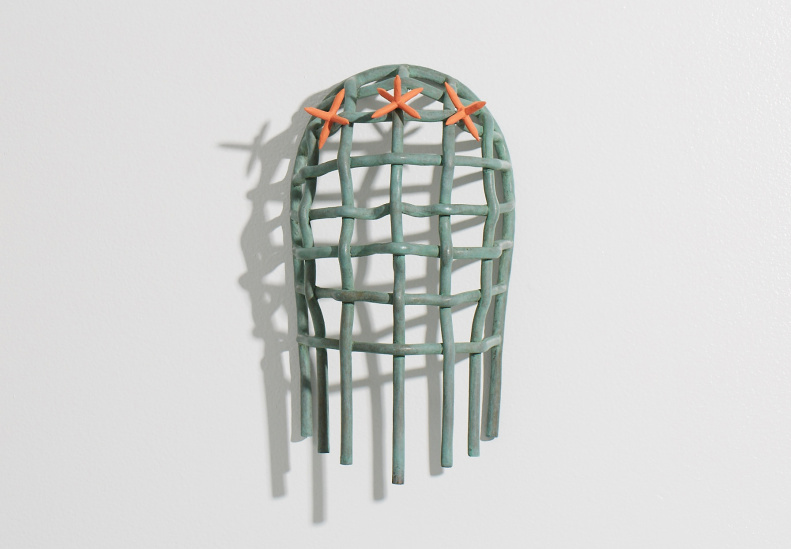 Referencing the woven meshes, skins, and corsets depicted in Braunig’s paintings, the sculpture continues a small, highly coveted series of bronze sculptures by the artist. Gyde takes the form of a masklike structure, meant to contain, protect, and decorate the face of the wearer, whom the artist sees as a female warrior looking out from within its loosely woven serpentine ropes. Gyde is hand-sculpted by the artist in wax and then cast into bronze from a two-part mold. In striking contrast with the mask’s hand-applied mint green patina, three spurs, each hand-painted by the artist in a radiant coral, protrude from the brow of the sculpture. Produced by Lisa Ivorian-Jones for the New Museum.